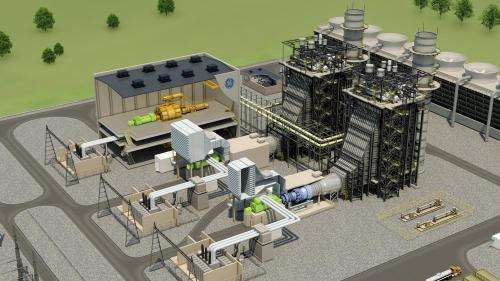 GE's FlexEfficiency 60 Combined-Cycle Power Plant. (Phys.org)—General Electric has unveiled its new line of highly efficient natural gas burning turbines for use in generating electricity. The new turbines are able to rapidly increase or reduce their power output to meet demand, making them, the company says, ideal companions to renewable resource based energy platforms. The new line of FlexEfficiency 60 turbines will be produced in several configurations ranging from 185MW to over 300MW, with initial deliveries scheduled for some time next year. The development of the new turbines comes at an opportune time for GE: natural gas prices have fallen dramatically in the United States over the past year as a result of new extraction methods. At the same time, rising concern about the carbon emissions from coal plants has utility companies eagerly looking for new ways to produce power. In addition to producing less carbon, the new turbines will give plant operators much more flexibility in responding to fluctuations in power demand. Coal plants are notoriously slow at ramping up or down, and older natural gas turbines weren't much better. The new line of turbines from GE allows for ramping up or down in minutes as opposed to hours, making them an attractive option for plants that use renewable resources such as wind or solar power. Being able to power-up during sudden periods of diminished sunlight—when a sudden thunderstorm hits, for instance—allows operators to switch over to natural gas almost instantly. The company claims the new line is also more efficient than previous natural gas burners, achieving 61% thermal efficiency. With this introduction, GE announced that it has already taken $1.2 billion worth of preorders for the FlexEfficiency 60 line, with sales to Saudi Arabian, Japanese and American utilities. The immediate interest has made it, the company says, the most successful introduction of a new energy portfolio in the company's history. According to representatives, GE's advances in jet engine materials that allow for more precise control of internal temperatures were applied to the development of this new line of natural gas burning turbines. Such precision is what makes the turbines more flexible and efficient. The new turbines will be built at the company's Greenville, South Carolina facility. Great, another advertizement of a Government Subsidized Monopoly. Like the Internet? You should shut off your computer JoeBlue unless you want to risk being branded a communist. The types of things for which socialism does or does not work can be derived from a series of graphs showing how well various things scale. When it comes to information, things like operating systems and music, Ubuntu/Jamendo all the way. Roads, schools, defense, call me a socialist there, it's true. I'm even a socialist about medical care and internet access. I'm a capitalist about most other stuff though. It's a mix. Going *all* capitalist or *all* socialist is doomed to fail. Neither works by itself, or at least not efficiently. I had no idea that GE was a monopoly. I agree with Chromosome2. Controlled Capitalism has it's place, in a socialist framework that places limits on it's socially destructive quality that values money and not societal welfare. It is this lack of corporate morality that is ultimately the reason why America has a failed, and socially self destructive culture. Money Grubbers will of course disagree that they are the cause of America's ills.